Elpida Memory (Elpida), Japan's leading global supplier of Dynamic Random Access Memory (DRAM), announced the release of a new x64-bit wide I/O 256-megabit Mobile RAM dubbed the "ECK2664JACN." The new product represents an optimum solution for the bandwidth critical image processing systems and achieves twice the bandwidth of existing 32-bit products while operating at an ultra-low voltage of 1.2V I/O (VDDQ). It features Elpida's unique product characteristics: enabling the highest possible performance for mobile phones and other mobile products and low-power consumption. 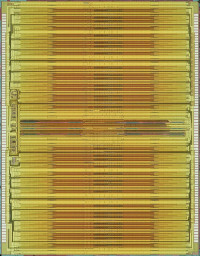 x64-bit 256-megabit DDR Mobile RAM with a clock frequency of 166MHz that enables a 2.6GB/sec high-speed data transmission rate. Ultra-low voltage of 1.2V I/O (VDDQ) based on world-leading technology to enable low-power consuming mobile products. Edge-pads for easy implementation in small form-factor MCP and SIP. Partial array self refresh (PASR), automatic temperature compensation self refresh (ATCSR), deep power down (DPD) and other standardized Mobile RAM special low-power functions enable a longer battery operating time. Elpida has already begun sampling the "ECK2664JACN" Mobile RAM. Volume production is expected to get underway in the second quarter of 2008.